McQueen takes my breath away again. 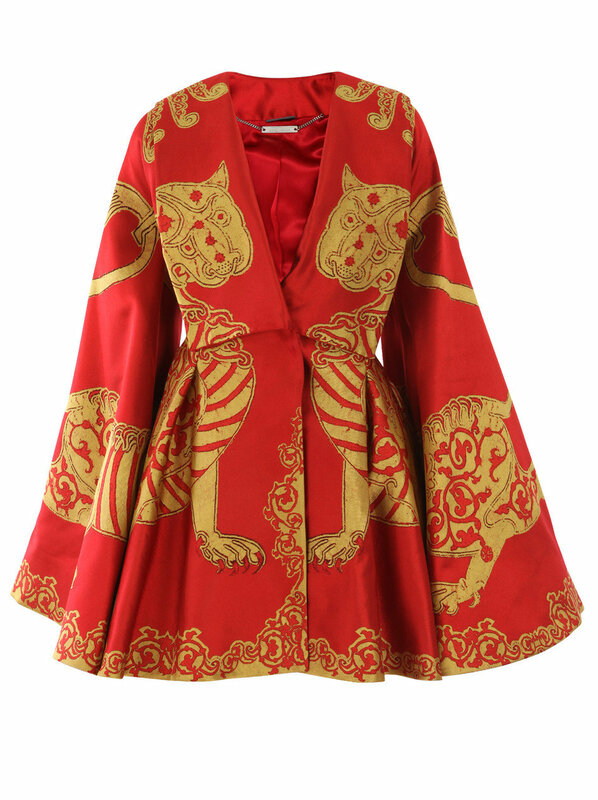 This bell sleeved coat is a symphony in daring red and gold silk, with dragons (or perhaps lions?) who demand your full attention — as would the woman who dares to wear it. Forever to stay firmly in fashion fantasy land (owing to a very real price tag), this coat has reminded me of one of my favorite fictional characters – Auntie Mame. Auntie Mame was originally a novel, published in 1955 and written by Patrick Dennis, detailing the adventures of a young boy named Patrick sent to live with his eccentric aunt in 1920s New York after the sudden death of his father. In 1958 Warner Brothers released a film based on the novel starring Rosalind Russell (lovelovelove!) in the title role. Auntie Mame is the consummate free spirit — she’s progressive, cultured, well-travelled, and hilarious. Her adventures are outrageous and she always manages to come out on top. She’s the kind of classy dame I aspire to be; swanning about Beekman Place while completely dripping in jewels, wearing gorgeous gowns and waving a jewelled cigarette holder about…even though I don’t smoke. I’ve already got the auntie bit covered, so all I really need is this darling McQueen coat. This film is a classic. If you’ve never seen it, you must, immediately. Yes! I would even lend you my copy, that is how much I love this film. Be sure to let me know what you think. Thanks very much! I adore yours as well. Your writings are so fresh and interesting. You are currently reading Dream a Little McQueen Dream of Auntie Mame at Quite Continental.